How to prevent the inside of your dryer from looking like decay and disaster. When a dryer is taking too long to dry your clothes, a lot of the time people think their dryer is going out or the heating element stopped working, but a lot of the time this indicates some sort of airflow issues. Airflow issues can also cause the safety thermostat to trip or the thermal fuse to blow, and usually when one of these parts go out its related to one of the following three things that I’m going to go over today. The first thing that I want to cover is your dryer’s lint filter. It’s very important to clean your dryer’s lint filter between each and every load of laundry you do. The lint filter is where the hot and damp air in the dryer needs to pass through before it leaves the dryer, and if the lint filter is blocked up the air can’t get out. When this happens your clothes aren’t going to dry or it will take a really long time for them to dry. The second thing that I want to cover is your dryer vent hoses. I’d recommend having them cleaned at least once a year. Over time the inside of the vent hoses will start to build up with lint causing the air that passes through the hoses to slow down which causes very poor drying. If the dryer hose venting is longer than 10 feet, I would recommend having them cleaned at least every 6 months or so. Just for the fact that air has to move through such a long hose, the lint gets trapped a lot easier than if the hose was short. And another thing to check is where the vent hose leaves the house, usually you have some sort of damper or flat or cover screen on the outside of your house. You need to check it every few months because a lot of times animals will build nests on the outside, or lint will build up and that causes restrictions around the end of the vent hose. And the last thing I want to cover is the dryer itself, this is just as important as the first two items that I covered. 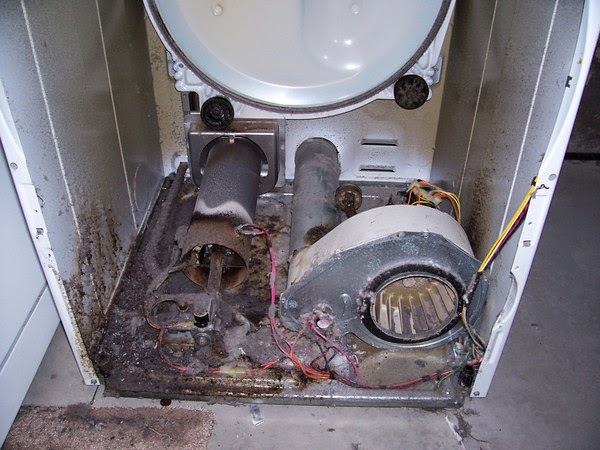 If you want to keep your dryer running efficiently, if you cleaned your lint filter between every load, if you keep your vent hose clean, the last thing you want to do is make sure you clean the inside of your dryer. I’m not talking about where you put your clothes inside the dryer, but the parts that you can’t see inside your dryer. The dryer isn’t exactly airtight so if you have some sort of venting issue the lint’s going to start to accumulate inside the bottom and basically put a layer of lint on top of the components on the inside including your heater, motor, thermostat and it could definitely start a fire. Lint will also build on the rollers, the pulleys, causing the belts to have a lot of friction whenever it’s going around and you’ll be replacing your dryer belts a lot more frequently than you need to.